Steel is one of the most widely used materials, particularly in construction, engineering, white goods, and automobile industries. Steel is also used widely in the manufacture of electrical motors, power generation (nuclear, conventional fuels and wind), power transmission, and railway network. It is also used for gears and engines where it has to be very tough and withstand high temperatures. There is a group of steels known as ‘Advanced High Strength Steels’ (AHSS), which are specially treated steels that can be rolled very thin without losing the element of strength needed for the specific purpose. These steels are particularly useful for the manufacture of automobiles, helping to reduce the overall mass and thus decrease the consumption of the fuel. Steels with a thin coating of tin are used to make cans for beverages and food. Steels coated in various ways with zinc are used in roofing, for example, and in automobiles as the zinc gives protection to steel against corrosion. It is estimated that there are more than 20,000 million tons of steel in use, which means that there is more than 2 tons of steel is in use for every person living on the Earth. The construction industry is the main user of steel. It uses steel from small buildings to huge bridges and uses it in multiple ways even within a single construction. A bridge, as an example, may use steel in the huge suspension ropes, the steel plate flooring for the road, the beams for the columns, and for the safety barriers and lighting columns. A large amount of steel is also used in the reinforce concrete. In fact, steel is either used or used to produce all the items needed in our daily life. The selection of steel for different usages brings a large numbers of benefits. All other materials are measured against the standard of steel. Steel is the superior material since it provides a large number of advantages over all other materials. There are several factors which make steel a preferred material amongst competing materials. Steels are alloys of iron, carbon and other metals and non-metals. The composition of the steel is adjusted so that it has the precise properties needed. The term alloy steel is confined to steels containing some combination of one or more of the various elements such as nickel, chromium, tungsten, molybdenum, vanadium, manganese, cobalt, copper, niobium, zirconium, selenium, and lead. Steels can be repeatedly recycled without any loss of performance. Steel enjoys an unsurpassed wide range of properties. First of all, its stiffness-strength-formability relationship contributes to featuring steel a high potential as versatile light-weight construction material. In this respect it pays to use steel, its price cannot be undercut without accepting compromises. This is topped by additional gains comprising high availability, reliability, excellent manufacturability and recyclability. Steel enjoys great popularity amongst designers. Most of the designers are very familiar with it. In inter-material competition, steel may not win in every single discipline, but steel is the undisputed champion in multi-discipline jobs. This makes steel an indispensable material. Steel allows a person to make the best material choice regardless of what he wants to do. The excellence and variety of its properties provided by steel mean steel is always the choice. The key facts in this regards are as given below. Steel is safer to use since its strength is consistent and can be designed to withstand high-impact crashes. Steel offers the most economic and the highest strength to weight ratio of any building material. Steel is the material of choice because of its availability, strength, versatility, ductility, and recyclability. Steel buildings are designed to be easy to assemble and disassemble, ensuring big environmental savings. Steel bridges are four to eight times lighter than those built from concrete. The rapid design, fabrication and erection cycle with steel allow the framing system to finish sooner than several other materials though it may be possible to start field work (work at site) earlier with those other materials. Steel enhances construction productivity because of its shop fabrication while maintaining tight construction tolerances. Field placed materials always lag behind the productivity curve. Productivity improvements for construction occur not in labour based field activities, but in shop based technology enhanced methods. Now technology is available in the form of 3-D interoperability and BIM (Building Information Modeling). This technology allows close collaboration between the designers, the suppliers and the contractors in the areas of design, fabrication and erection of building structures made of steel. This also results in designs which save both cost and time in the process of construction due to the integration of fabrication and erection efficiencies in the design as well as passing of the design models between analysis, detailing and fabricating activities. This complete integration process is unique to steel and results into substantial savings in the total cost. Steel construction results into speedier erection during all seasons. It also results into close tolerances maintained for integration with other building systems. There is minimal site waste with steel construction. With other materials the field work can start earlier, but the quick design, fabrication and erection cycle with steel allows the framing system to finish faster and the constructed item is available for use earlier. Steel is widely used in all types of structures since it results into lower overall cost of the project due to its relatively high strength to weight ratio and speed of construction. 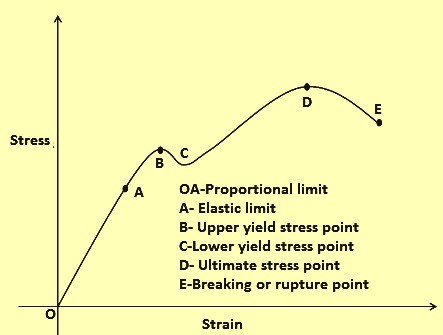 Further, steel being a ductile material, behaves elastically until it reaches yield point (point B on the stress-strain curve), when it becomes plastic and will fail in a ductile manner (large strains, or extensions, before fracture at point E on the curve) (Fig 1). Another advantage of using steel is that it is equally strong in tension and compression. Structural steel is a preferred material for construction because of the following reasons. Readily available – The structural steel industry has the production capacity to meet the demand requirement from the construction industry. Further, since the shapes, sizes and qualities of the structural steel needed by the construction industry is not very special, the steels are always available of the shelf to the user and he need not maintain large inventories. High strength – All other materials talk about high strength, but their strength is still less than that of structural steel even when enhanced by steel reinforcing. In fact, the increasein the standard strength of steel used in buildings today compared to a decade ago is greater than the total strength of competing ‘strength’ materials. Structural steel has typically strength of 350 N/sq mm which indicates that the steel has a yield stress of 350 newtons per square millimeter both in compression as well as intension. By comparison, a normal concrete mix has a yield stress of 20 to 30 N/sq mm in compression only while ‘high strength’ concrete may have a compressive yield stress of 70 to 80 N/sq mm. Not only is structural steel a stronger material, it also has a much higher strength to weight ratio than other materials. This results in the building being lighter and lighter buildings require less extensive and less costly foundations. Aesthetic appeal – Structure designers like the natural splendor of steel and are excited about exposing it in the design of the structures to emphasize grace, slenderness, strength and transparency of the frame. Structural steel allows the structure designer a greater degree of expression and creativity in their design than any other construction material as they address both the functional demands of the building and unique identity of the owner of the structure. Column-free clear spans, the use of coloured coatings and the opportunity for natural lighting highlight the elegant simplicity of using structural steel. Structural steel sections can be bent and rolled to create non-linear members to further enhance the aesthetic appeal of the structure. Design flexibility – From the simplest functional structure to the complex signature design, structural steel can be readily used to accomplish the design intent of the designer and the structural engineer. No other framing material comes close to structural steel in the ability to encourage freedom of expression and design creativity. The project designers and structural engineers can have a lot of flexibility when they use of structural steel in the designs of the structures. Ease of design – Structural steel remains the most desirable material for the structural engineer for the designing of the structures. Tools for structural steel design abound and are a quantum step ahead of tools for other systems. Full integration between analysis, design, detailing and fabricating software is available and is in use these days. The structural steel industry uses collaborative BIM tool these days. This innovative blending of technology is not just for simple boxes, but also for complex structures requiring innovative design approaches and the cost saving techniques of 3-D modeling with full steel specialty contractor involvement in the design process. Lower project costs -The comparison of the cost of competing framing systems for projects using comparable cost data show that structural steel remains the cost frontrunner for the majority of construction projects. Comparative studies indicate that a structural steel framing system including decking and fire protection costs less than a concrete framing system. Unmatched sustainability of steel – Sustainability is very closely associated with the structural steel. In fact, structural steel is the most recycled material in the world. Structural steel even made of 88 % recycled product, is fully recyclable in the future and can be reused without further processing. The carbon footprint of structural steel has been reduced by 47 % since 1990. Energy used in the production of structural steel has been reduced by 9 % in the past 10 years and over 30 % in the past three decades. Further, the production of structural steel conserves our most valuable resource which is water. The only water used in the production of structural steel is make-up water added to a closed loop recycling process. Steel plants using structural steel mills discharge no water to the environment. Water is not used in the fabrication process and no water is used or discharged at the project site. The recycling rate of structural steel at the end of their life is 100 %. Rather than utilizing land for quarrying operations to provide aggregates or as landfills for construction material waste, structural steel is emptying salvage yards allowing that land to be used for other purposes. Today demolitions are often paying for the opportunity to demolish and scrap a structural steel framed building because of the value of the structural steel. By contrast buildings using other materials has cost per square meter to demolish, scrap and landfill. Innovative – New systems such as ‘Girder-Slab’ and ‘Side-Plate’ have recently entered the market in response to designer demands for new approaches to projects. These new systems join ongoing innovations addressing issues such as long-span deck systems, fire protection, connection optimization, coating systems, and progressive collapse systems. The structural steel industry continues to pioneer new innovations for both the material and the use of structural steel. The migration of the material specification for hot rolled structural sections from normal steel to high strength steel has increased the yield stress or strength of the material by 40 % from 250 N/sq mm to 350 N/sq mm. Design tools continue to mature to allow more efficient steel designs. Also further research activities are going on to improve the understanding of the behaviour of structural steel with the goals of increasing industry productivity while bringing greater economy to projects. The structural steel industry pioneered the movement toward open standards and interoperable software that has most recently resulted in the growth in popularity of Building Information Modeling. In 1990’s the American industry adopted CIS/2 as a standard data protocol for the exchange of information between structural design, detailing and manufacturing/fabrication programs. The result was that software programs from different vendors were suddenly able to exchange model based information beyond simple geometry. Projects taking advantage of this vertical integration within the structural steel industry were able to demonstrate cost savings of up to 20 % on the structural package. The success of the CIS/2 implementation within the structural steel industry has encouraged the broader design and construction marketplace to pursue similar open standards and data protocols for the exchange of model based data between design disciplines and in other industries vertical supply chains. Building Information Modeling functions best in a collaborative project environment where project developers, designers, engineers, general contractors and specialty contractors work together as part of an integrated project team. The structural steel industry in USA embraced integrated project delivery in the early 2000’s through an industry wide training program presented in partnership with the Design-Build Institute of America. Today, the innovative approach of early involvement of steel fabricators (specialty contractors) is accelerating project deliver, lowering project costs and improving project quality. Modifiable – Structural steel buildings can be modified in the future for new applications, loading conditions, vertical expansions and changes in owner desires in ways that other framing systems can never accomplish. Building owners and managers are always faced with changing requirements and a composite steel frame can be easily modified to satisfy existing or new tenant changing requirements such as increased floor loads for storage and equipment, new openings for mechanical equipment and vertical shafts for floor-to-floor staircases. Existing steel columns and beams can be strengthened through the attachment of steel plate to the flanges or web of sections allowing for greater loads. New stairways can be added to existing steel framed buildings by removing a portion of the floor decking, bracing a single bay and adding the desired stair structure. These types of changes can be accomplished with little disruption while the building is still occupied. Efficient – Structural steel buildings optimize building space efficiency through the use of slender columns maximizing useable floor space, longer spans for open, column-free spaces and the integration of HVAC systems into structural spaces allowing reduction of floor-to-floor heights. The steel column typically occupies 75 % less floor space than an equivalent concrete column. At the same time structural steel allows longer spans which eliminate intermediate columns creating open floor areas ideal for today’s office layouts. Parking structures benefit from smaller structural steel columns and longer spans as well. Structural steel framing systems for parking structures typically span 20 meters allowing for a drive lane and 2 parking bays without any intervening columns. The use of the smaller footprint steel columns at the front of the parking bays create less intrusion into the parking space than larger concrete columns. In fact, because of the smaller footprint of the columns, steel framed garages can provide one level of service above the standard level of service for parking garages of similar dimensions framed in concrete. Reliable and predictable – Structural steel is manufactured and fabricated under controlled conditions using modern quality assurance processes. The final strength of the material is verified at the point of production, not after the material is already placed in the frame of the building. Structural steel is shop fabricated to close tolerances impossible for site cast materials. Different international standards closely define the properties of structural steel whereas the actual properties of cast-in-place concrete are a function of concrete mix design, local aggregates and delivery conditions requiring testing of samples 28 days after the material has already been placed in the structure.